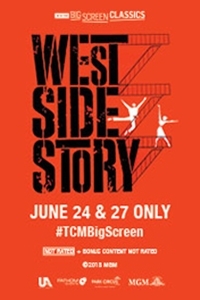 Fathom Events, Turner Classic Movies and MGM are bringing West Side Story to select cinemas nationwide for a special two-day event, which includes exclusive insight from TCM host Ben Mankiewicz. West Side Story explores the rivalry between two teenage street gangs - white working-class Jets and Puerto Rican Sharks. When a member of the Jets falls in love with the sister of the Sharks' leader, things look hopeful at first, but rapidly go downhill. Illustrating the events are many memorable song and dance numbers such as "America", "Somewhere" and "I Feel Pretty".